Awhile ago, my niece asked me if I could make a small doily for a dreamcatcher she wanted to make. Doilies are NOT my thing but I thought I had some my mom made and was going to give her one of those. My intention was to find it right away but time got away from me and I never got around to it. She asked again and I forgot again. Recently, she asked again (I’m a bad auntie) so I actually looked this time but couldn’t find the ones I was thinking of so I decided to go ahead and make one for her. She requested something simple but as usual, I went on a Pinterest binge and started looking up all the doilies under the sun. Then I found out she needed a tiny doily so that set me off on a different quest because size changed everything! The type of yarn I needed, the pattern for something small like that, etc. I found this (below) before I knew it needed to be small but I just followed the pattern until I got the size she needed. The pattern can be found here. Here’s how far I got for the palm sized doily she wanted (below). My niece liked it so I had to make her another one that she didn’t ask for in case she didn’t like the first one. Did I mention she already liked the photo of the first one? I whipped up a second one that I made up, just to give her choices. 🙂 Sadly, I didn’t take pictures of that one but it was cute. And then, she asked if I could make her a scarf with some yarn she bought. I love making scarves. I don’t wear scarves that often so I don’t get the chance to create them for myself so I agreed. And you can guess what happened. Pinterest! I searched thousands of pictures (yes! thousands!) and then found out it was chunky yarn. Well, that lead me on a different search for scarves made with chunky yarn. When I finally got ahold of the yarn, I tried different pattens on it but I didn’t like how they were coming out. I changed gears and went for something more simple. In my slippers post, I mentioned that I made some flowers from a pattern that I saw on the Knit and Crochet Show on PBS. The flowers were for a headband that I didn’t care to make at the time but I liked the stitch pattern so I adapted it for my niece’s scarf and it worked out. I used the left over yarn to make those same flowers. I did the scarf from memory from the stitch I saw on the show. Here is the link to the headband pattern (you need to register to download it but I like this site and would recommend it). Even though I was going from memory, I coincidentally used the exact same stitch count as the headband pattern but because I used a very chunky yarn, it came out much larger 🙂 and I obviously did many more rows than they did. Do as many rows as you need to get the desired length. I did something slightly different on the ends of my scarf that are not in the original pattern. I started the scarf with a row of double crochet followed by a row of single crochet and then I followed the pattern. When I reached the length I liked, I did a row of single crochet followed by a row double crochet to finish it off. I also changed colors. I had less of the pink colored yarn than the white so I did four rows of pink and six rows of cream and repeated that until the end. My niece was pretty happy with the end result. You might be wondering if I stopped at one scarf and it probably won’t surprise you to know that I did NOT stop at one scarf. I made another because I was on a roll. Recall I looked at THOUSANDS (this might be a slight exaggeration) of pictures so I had a lot of ideas rattling in my head but that’s a blog post for another day! I know Christmas is over but I thought these peppermint coasters were so awesome that I wanted to share them. Here is the YouTube video. Sometimes while at work (after school program), I have a little time to crochet. The kids get a real kick out of seeing me make something and they usually offer all kinds of advice on how the project should go. They almost always want to learn how to do it. It’s a win-win situation because I get to create something while at the same time teaching and entertaining the kids. 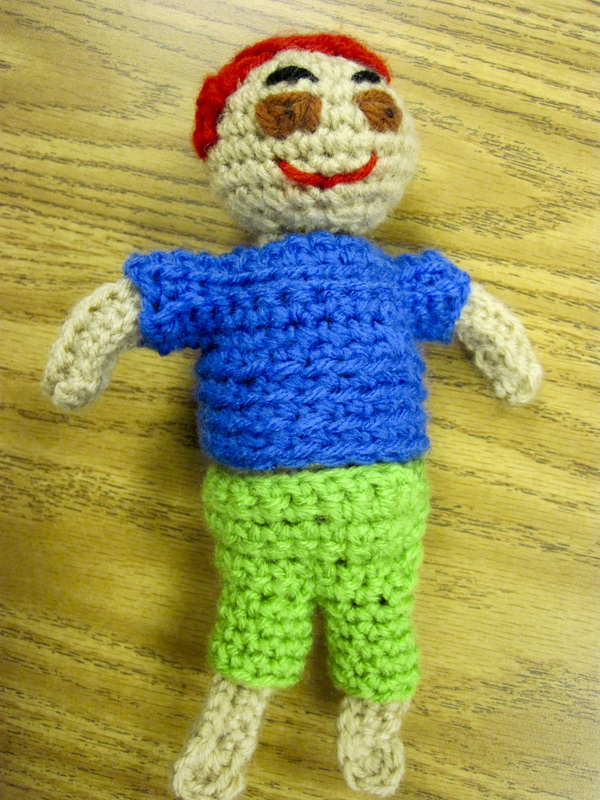 I started making a little doll at the end of the last school year and got as far as making the head, body and one leg. I recently pulled it out while taking care of the kinders and it was hysterical how much advice I was getting. This color hair, has to be a boy, has to be a girl, this color clothes, etc. I thought the doll came out a bit funny looking but the kids kept taking it and playing with it. They were all asking if they could keep it or if I could make them one (or a superman doll, a captain america doll or whatever character they happen to like) but I have to tell them I can’t possibly make so many things for so many students but that I can take suggestions and then either put it in the toy box for all of them to play with it or put the finished pieces in our prize box so someone can take it home. With this particular project we decided to put it in the prize box (because they all wanted it and were sure they would get to it first). When done with any project where they had input, the kids absolutely love that they were part of the process. They are very proud that I thought enough of their ideas to actually implement them (my words, not theirs :-)). Did I mention it was kinda funny looking? I’m glad I finally got to finish the doll so it could stop taunting me every time I pulled out supplies from our craft closet. It sometimes surprises me who ends up picking the things I make. There are always a few kids who say they can’t wait to go to the prize box to get one of my crocheted items only to get something else when they actually get their turn. And then more surprisingly when someone who showed no interest snatches it up and is all proud they got it. In this doll’s case, a child who I didn’t expect would want it, grabbed it, pulled it out of the baggie I placed it in and started playing with it with a big smile on his face. I think it was a big surprise for him too since I placed it in there a day before he made it to prize box. I can’t remember if he saw me working on it last school year. I know he didn’t see me finally finishing it this year because I worked on it before his regular arrival time at which point I would put it away so I could get the kids started on homework. It must have appeared as if by magic in the prize box because he seemed so happy to get it. It always makes my heart feel a little warmer whenever the kids truly love something I make (even when I’m not 100% in love with it). I’ve had a few requests for Hello Kitty purses so I when I get the chance again to work on a crochet project, I think it will be some purses and phone cases. They are easy to make and I can finish them more quickly but maybe I’ll give a go to that Superman request even if it takes me all year :-). 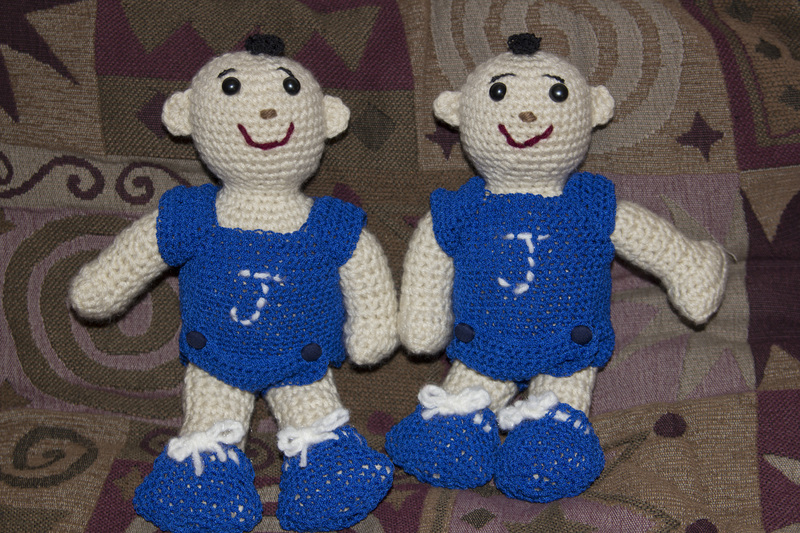 I’ve been working on the twin babies I promised my mom-in-law. I’m finally done! I just finished up their outfits and booties and I can ship them off. She wanted them to wear onesies and since I had never made a onesie, I had to learn how to do it. I was at my sister’s house (again) while I was trying to figure out the outfits and searching the internet when she pointed out that what I was looking at was not right. I was in fact looking at sleepers or something but not onesies. I totally disagreed with her because I was so sure that what my mom-in-law wanted was what I was looking at even though she called it a onesie. I insisted both could be called onesies. My sister insisted I was wrong (as big sisters are known to do) and made me check with my in-law to be sure. Well, I begrudgingly admit she saved me because she was right. The outfit I thought I needed was actually more complicated so she saved me from time wasted looking for and creating the wrong one. Once I was on the right track, I looked at pictures and patterns for inspiration. I l scanned several patterns to get a general idea of how they are done and then made one of the babies his onesie. The other doll came out a tad bit smaller so I modified it again to fit him better (plus I didn’t write the first one down so I had to guess at what I’d done but I’ll write it down next time :-). 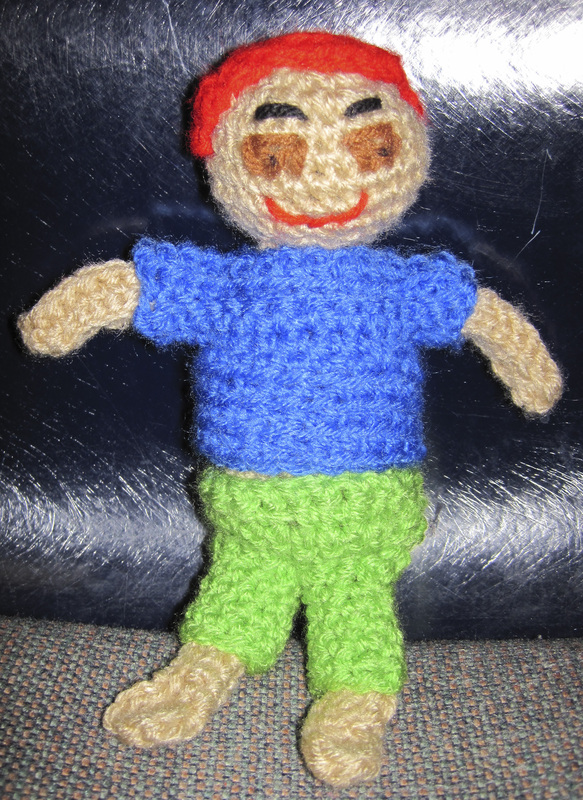 Today I was going to pull out a box of crochet toys I made for my daughter when she was little and photograph them. I wanted to write a post about how I started my love affair with making whimsical things. I had it all planned out, and went digging all through the garage looking for said box of nostalgia. To my horror and dismay I couldn’t find it! A bit of back story before today’s tale of woe is in order. My daughter held on to these toys up until she was a teenager. Then it gets fuzzy as to what happened to said items (and there is some debate about it between us). At some point, her Barbies and all the doll furniture and doll clothes I crocheted went into a box. She claims I took them from her in order to protect them. It could have gone down that way. Then she went to college and eventually moved out. I’m not sure when it happened but I’m pretty sure I asked her to take them or I was going to get rid of them. Here’s where it gets fuzzier.